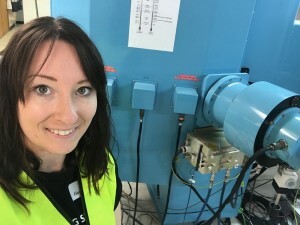 Real Scientists is stargazing this week with Dr Fiona Panther (@fipanther), Associate Lecturer in Astronomy and gamma-ray astrophysicist at UNSW Canberra. Welcome to Real Scientists! Can you tell us a bit about how you got into astronomy? I’ve always loved science and learning about the world around me. Both of my parents are scientifically trained (dentists), and they taught me that it’s possible to find the answers to your own questions if someone else doesn’t know the answer. That really drew me to science. I particularly loved astronomy: I remember getting my Brownie Guide astronomy badge by pointing out constellations. When I went to university, I knew I wanted to study how the universe works, so I chose to study physics and maths. I wasn’t always the highest achieving student – I wasn’t dux [highest-ranked] of my school or first in class for anything throughout my undergrad years, but I was so excited about physics and math that I always wanted to learn more. During my honours year, I discovered that research suited me much better than classes with exams, and the feeling of discovering had me hooked! What got you interested in gamma-ray astronomy? I loved astronomy, but I didn’t want to specialize on just looking at one thing as I was interested in such a range of physics problems. The amazing thing about gamma-ray astronomy is that it ties together particle physics, nuclear physics, math, computer science, statistics and instrumentation (yes, even theorists need to understand where the observations we’re trying to explain come from), so I am able to explore all the areas of physics and math that interest me while I do my research. I try to understand how processes that occur on subatomic scales – like nuclear reactions, and the interactions of electrons and protons with the electromagnetic field – shape our Universe. My PhD focused specifically on understanding the origin of Galactic antimatter [RS Note: Please say this is already a band name]. Antimatter is like matter’s evil twin – every particle has an equivalent ‘antiparticle’ with the same mass but opposite quantum properties. When matter and antimatter meet, they ‘annihilate’ – this is the only process which is 100% efficient at converting mass into energy. The energy is released in the form of gamma-rays, which we can observe using special detectors like gamma-ray telescopes. I try to explain the observations made by these gamma-ray telescopes by using computer simulations and theoretical calculations to model how anti-electrons (positrons) and radioactive nuclei are produced and transported around our Galaxy. Is there something you want people to know about your work? Taking ‘pictures’ of gamma-rays is a very hard problem, as gamma-rays can’t be focused the way visible light can. This is a problem for astrophysics, as we want to create a picture of where gamma-rays are coming from in our Galaxy, but it’s also a problem in the field of cancer diagnosis and treatment, which can use gamma-rays. By refining the methods we use to take gamma-ray pictures of space, we can pass these discoveries on to the medical imaging community. Gamma-ray astronomy also gives us insight into where the elements that make up life on Earth – like oxygen, carbon and iron – come from. That is seriously cool. What do you get up to when you’re not in the lab? I’m involved in a mentoring program for high school students called ‘Science Scholars’ – it’s an opportunity for keen high school students in Australian Capital Territory who want to experience research to take on a project for several months. It’s a wonderful program because it’s open to students who are keen, not just the students with the best academic histories. Often, students who may not be the best at exams benefit the most and find it easier to learn in a research environment. Mentors also run academic writing and presenting program for these students – skills that aren’t usually taught, even at PhD level. One of my hobbies is building scale models – things like airplanes and tanks. I tend to really suffer from perfectionism affecting me in a negative way – I can get overwhelmed by thinking that for anything I do to be good, it has to be perfect. Scale model building is a good way to challenge this for me – you can still create something that looks amazing, even if it isn’t perfect. What does a perfect day off look like for you? I like to get up fairly early, even on days off. The perfect start would be a cup of tea and some vegemite toast with my partner, then heading out for a hike. Canberra is great because there are lots of areas to go for a hike on our doorstep. Then be home in time for lunch and spend an afternoon catching up with my parents via skype, reading and then cooking something yummy for dinner (I love trying out new recipes). Fiona Panther, welcome to Real Scientists!